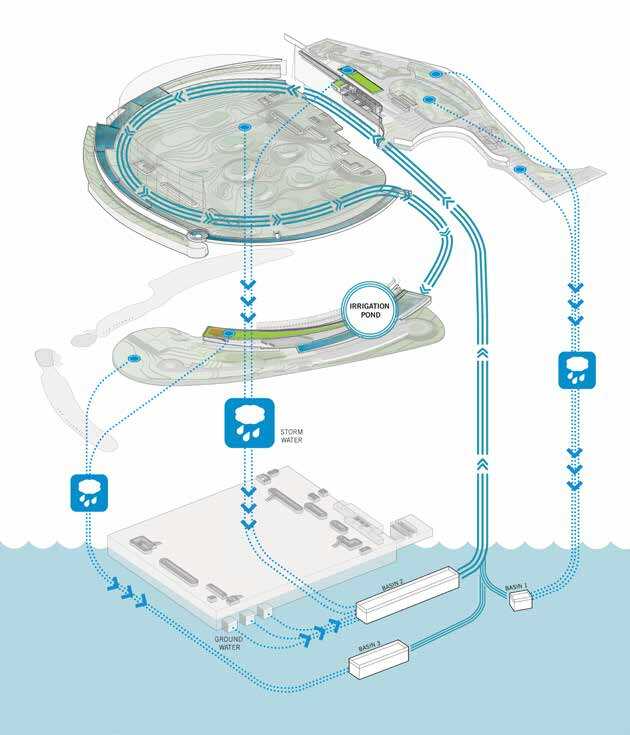 Mixed-use water treatment infrastructure development including recreation, filtration, and ecology. An above ground recreation (technically a 9-acre green roof), an artificial wetland ecosystem, integration between landscape and urbanism, and an underground water filtration plant. What more could you ask for? When complete, this plant will supply up to 30% of New York City’s drinking water. The Croton Water Filtration Plant Project, designed to filter and deliver 290 million gallons of water per day - up to 30% of New York City’s potable water supply, is an integral part of the city’s infrastructure and was required under a Consent Decree entered into by the State of New York, New York City and the Federal Government In 1998. In that decree, the city agreed to site, construct and operate a facility to filter water from the Croton Reservoir system. In 1999, after extensive public hearings and comment, the New York City Council approved the Department of Environmental Protection’s application to site a water filtration plant at the Mosholu Golf Course in the Bronx. The design of the Above Ground Buildings and Landscape (the filtration plant is below grade) was procured by Grimshaw in 2006 under the New York City Design and Construction Excellence Initiative (D+CE). Developed and led by Michael R. Bloomberg since 2004, the D+CE is a great example of how governmental programs can propel visionary design leading to inspirational, sustainable, and high quality design that is publicy funded and managed by government agencies. In large part, the D+CE has enabled the success of the Above Ground Buildings and Landscape at the Croton Water Filtration Plant. Through this project, the New York City Department of Environmental Protection (DEP), the Department of Parks and Recreation (DPR) and the Department of Design and Construction (DDC) are working together to create a global landmark: a complex, publicly funded civic infrastructure project at the forefront of environmental strategies on the largest scale that will update our essential urban infrastructure while simultaneously promoting community and providing a public amenity. The 24-acre site at Mosholu Golf Course was chosen for plant construction in late 1998. A federal government mandate demands that any facility displaced by the construction of the plant must be restored following the completion of the project. Therefore, the course’s driving range and tee boxes, club house and parking lot had to be redesigned and reconstructed after the plant was operational. As a result, the program required the seamless integration of a publicly accessible golf course driving range and clubhouse with the above grade facilities that service the plant. All of this is in concert with the local landscape and ecology of one of New York City’s largest and well known public park lands – Van Cortlandt Park. With the introduction of the 9-acre water filtration plant at the site, the Mosholu Golf Course will have a decrease in permeable surface area, severely reducing the ability of the site to absorb rainfall. Inspired by the treatment of drinking water – the very reason the plant is required – the design team looked to natural water treatment strategies to manage the water, demonstrating the need to provide sensitive building development that improves the natural environment rather than damage it. As the Croton Watershed is developed and population increases, best practices for stormwater management must be a high priority if we are to prevent contamination of the city’s waterways through the combined sewer system. New York City has often suffered unsafe water conditions when excess stormwater overloads its sewage treatment plants, discharging raw sewage into local waterways. 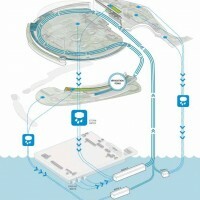 By demonstrating best practices for stormwater management on an urban scale, the design team has developed a sophisticated water balance system that retains stormwater on site, prevents discharge into the city’s combined sewers and stores it for irrigation for the driving range and golf course. The system also acts as a natural security barrier, preventing access along the perimeter of the plant and insuring the security of the facility. It is an essential component that performs a dual purpose. Both ground and stormwater make up vast quantities of water that would otherwise be discharged into the city’s combined sewer system. The purpose of the plant is to collect, clean and store this water on site, eventually reusing it for irrigation and other non-potable water uses rather than resorting to potable water. Beginning below grade, ground water seeps through the bedrock and is deposited at the base of the water filtration plant. From here it is collected and moved by dewatering pumps up to retention basins near the surface. An estimated 55 gallons per minute will be collected here. Rain water will also be collected and retained in these underground basins. 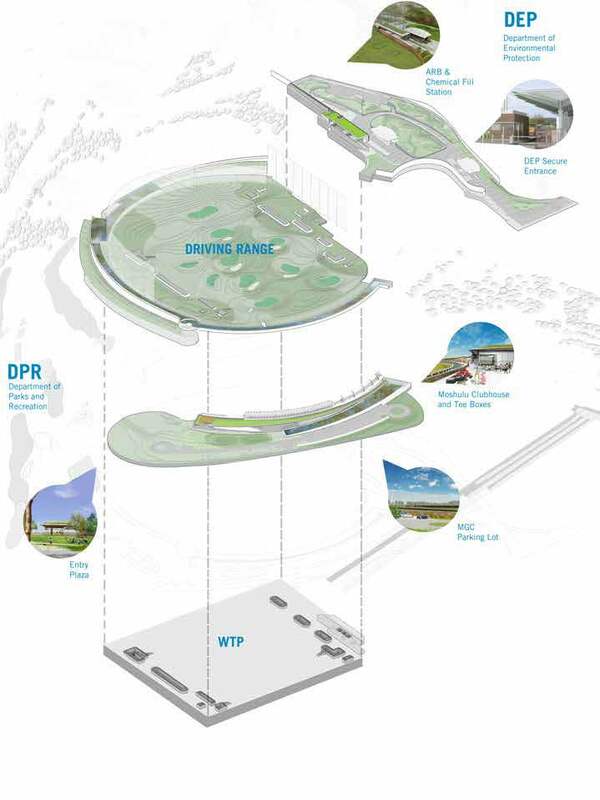 A 9-acre green roof located on top of the filtration plant will see the largest volumes of water. Finally, a system of bioswales and runnels collect the remainder of the site stormwater runoff from roadways and parking lots. The swales move water across a planted system designed to absorb water and process parking lot contaminants that sometimes include heavy metals or petroleum products. At the end of the swales, remaining water drains into the storage basins to join collected ground and other site stormwater.